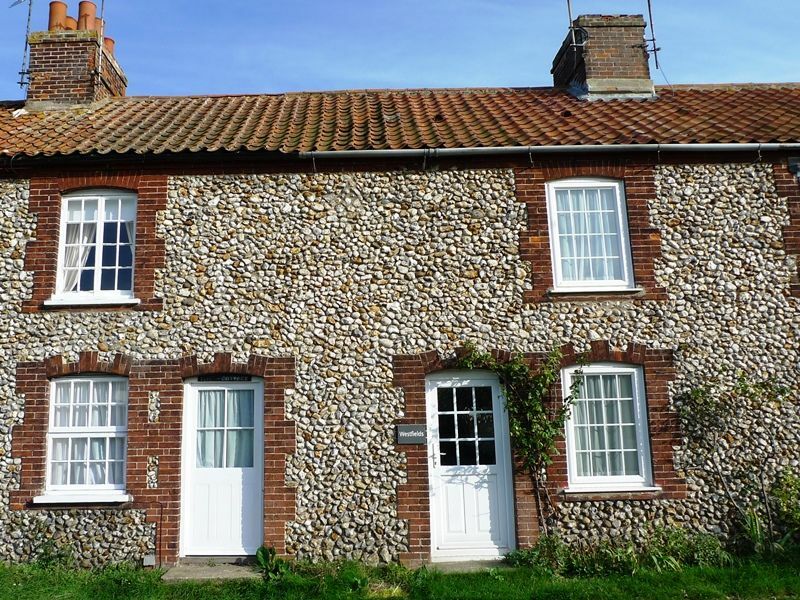 Westfields is a Norfolk flint and brick cottage which has been refurbished to make a comfortable home, with the advantage of a spacious open plan kitchen/living area. It is a perfect place for a couple or a family to stay throughout the year, being within walking distance of Burnham Market's village green with its excellent selection of independent shops and galleries, as well as the renowned Hoste Arms hotel. The beautiful, unspoilt Norfolk coast is easily reached within a 10 minute drive, or a trip on the local Coasthopper bus. Downstairs has been opened up to create an open plan living area with oak flooring, which has the kitchen at one end and the sitting area at the other. Kitchen: Well-equipped fitted kitchen with beech units, slim-line dishwasher, integral fridge/freezer, integral washer/dryer, an electric oven, microwave. There is a dining table with 4 chairs. Sitting area: with a woodburner, sofa and 2 chairs and freeview digital TV/DVD. Shower room: Walk-in shower, hand basin and WC. The stairs lead up from the sitting area and are not too steep with a hand rail. Bedroom 1: Light and spacious room with a kingsize bed, bedside tables and lamps, painted chest of drawers, painted wardrobe and a chair. Bedroom 2: With twin beds, bedside table and lamp, an i-pod dock, small clothes hanging rail and a chest of drawers. A hairdryer is available at this property. Whilst there is no designated off-street parking, there are no parking restrictions and it is possible to park just opposite the cottage. There is a small private courtyard garden immediately outside the kitchen door which has been landscaped with all-weather grass and a patio area. There is outside furniture. Burnham Market's village green and shops are within a 10 minute walk.